Blog Does your child wear a coat while travelling in the car? Does your child wear a coat while travelling in the car? This question has been in the headlines recently as it seems more and more people are putting their children in car seats wearing padded or puffy winter coats. With winter still biting at our heels and a chill in the air, many parents are unaware of the hidden dangers of securing your child in their car seat while wearing a coat. At BubbleBum travel car booster seats we recently carried out a survey of over 200 people and a huge 49% of people admitted to putting their child in a car seat while wearing a winter coat. Many people are aware of the dangers of this common practice, but continue to let their child wear a coat while in the car anyway. In a collision, if the harness on your child’s car seat is not tight enough to properly restrain them, their coat will become compressed creating the potential for them to be ejected from the car seat. As a rule, your child’s coat should be removed before they are placed in their car seat, and the harness should be tightened so that it’s a secure fit to your child’s chest. If you can fit two fingers between your child’s chest and the harness then it’s not tight enough and should be adjusted. You can also perform the pinch test when your child is buckled into their car seat. If you are able to pinch together the harness material at the child’s collarbone, then it’s too loose. You should NOT be able to pinch a secure harness. If the weather is cold and your car isn’t warm, you can place your child’s coat over their arms at the front so that the coat acts as a blanket keeping them warm. You can also make sure your car’s heating is on, making it nice and snug before you put your child in the car. If you decide to use a blanket on your child while in the car to keep them warm, make sure the blanket is tucked in and does not come above their armpits. As a side note, there is also a risk of your child over-heating if they are wearing a coat while travelling in a car. 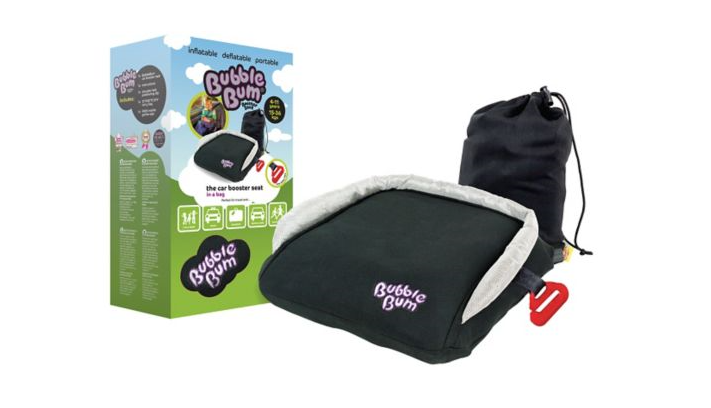 BubbleBum Travel Car Booster Seat recommends removing your child’s coat before they are placed into their car seat and it should remain off while travelling. There are many other methods to keep your little bundles toasty warm while in the car this winter. BubbleBum is a compact, inflatable, lightweight, car booster seat that makes it easier than ever to make sure your child travels safely on every single car journey.